Dale Benjamin Conklin, 87 of Midland, died Thursday evening, November 1, 2018 at MediLodge of Midland. He was born October 7, 1931 on the family farm in Merrill, son of the late Martin Edward and Marguerite (Tyron) Conklin. 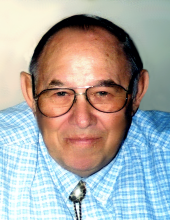 Dale attended Merrill Schools and helped tend the farm. In 1952, he decided to proudly serve his country and enlisted in the Army. Dale was stationed in Alaska during the Korean War and helped build airfields and operated military equipment until his honorable discharge in 1954. He was a truck driver for Short Freight Lines for many years. In 1981, Dale married the former Gloria (McBurney) Schlamp in Midland. Together, the two enjoyed camping, traveling, and just being with each other. Dale loved to hunt and fish and spent much of his time outdoors. He truly treasured his family and was so proud of everything they did. To plant a tree in memory of Dale Benjamin Conklin, please visit our Tribute Store. "Email Address" would like to share the life celebration of Dale Benjamin Conklin. Click on the "link" to go to share a favorite memory or leave a condolence message for the family.